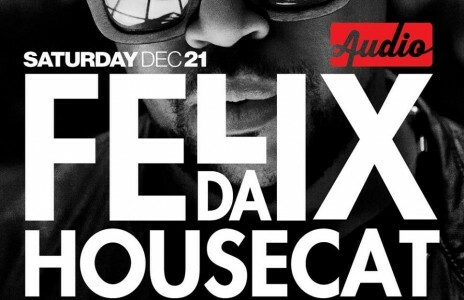 Audio is proud to present the one and only, FELIX DA HOUSECAT! Dedicated to making the people dance. He is one of those rare, charisma-oozing characters, whose musical and mental eccentricity come from a genuine place. He’s never afraid to take a risk to reach new ground. It’s this blend of qualities that has kept him in such high reverence in the electronic field for two decades now, and which has ensured that his music has been a consistently captivating force. An ever-moving target, his various incarnations have seen him morph from resolute acid and techno warrior to avant-garde nu-skool electro-disco pioneer to the man who gave one of the world’s most famous rappers a new lease of house-infused life long before major labels were putting every urban artist on their books over anemic 4/4 beats. “My dad played sax and he got me onto clarinet” he recalls of his beginnings in making music, “so it was more of a discipline thing. It was never like, I was this passionate kid who wanted to be a… superstar. Or a superstar DJ, or a rock ‘n’ roll star. 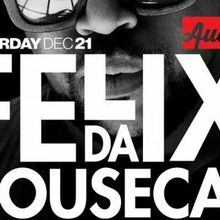 I was quite shy in school.” First seduced by electronic music when house music first emerged in his native Chicago in 1984, the young Felix soon found himself getting caught up in a musical paradigm shift that fostered a lifelong obsession and helped to bring him into his shell. “It was like a culture movement. So everything I heard on the radio – from Farley ‘Jackmaster’ Funk to Mike ‘Hitman’ Wilson – that was the sound I was exposed to. Coming from a family of music, I was able to replay and recreate that stuff.” But it was too late for classical training to keep a hold on this burgeoning young talent and dance music aficionado. Da Housecat took over. Opening sets by Andrew Phelan and Mario Dubbz.